Bill received his Bachelor’s of Science in Physical Therapy from the University of Vermont in 2000. After graduation, he began practicing in an outpatient orthopaedic clinic affiliated with a small community hospital in upstate Vermont. Bill joined MTI in August 2002 as a staff physical therapist after moving to Seattle with his wife. Between 2002 and 2005 he completed intensive residency and fellowship training for the Doctor of Manual Therapy certificate degree programs offered by the Ola Grimsby Institute (OGI). In 2007, Bill completed a one-year certification program in exercise science from the Ola Grimsby Institute. Bill treats patients in our Magnolia office and is involved in clinical development and education for the entire company. He also serves as a clinical instructor, mentor and faculty chair for the OGI. 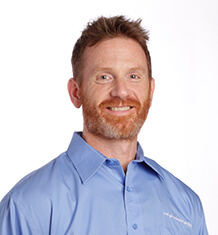 He has developed a seminar series for educating physical therapists, physical therapist assistants and athletic trainers in exercise progressions for all joints. Teaching is Bill’s passion as it not only helps to improve his clinical skills and knowledge, but also promotes the advancement of the profession by contributing to the improvement of his students’ skills. Bill has taught both weekend continuing education courses and yearlong certification and residency programs since 2007. He has also been involved in writing and editing a professional textbook focused on therapeutic exercise progressions for musculoskeletal and neuromuscular disorders. In his free time, Bill enjoys alpine skiing, mountain biking and backpacking in the mountains of Washington.